A commission for MUTEK and supported by a residency at the Banff Centre for the Arts and the Conseil des arts et des lettres du Québec, "Three Pieces With Titles" is a brand new live performance featuring a custom, souped-up, real-time audiovisual instrument from Montréal studio artificiel. The piece makes its world premiere at MUTEK in August as part of the A/VISIONS program. We met one of its creators and self-identified "digital luthier", Alexandre Burton to talk media art, process and his fascination with "Nows". The name artificiel was half a joke to support the fact that artistic creation is necessarily artificial. At the time it was the beginning of new media, and in response there was a return to "natural" approaches. One could sense this tension between technology and non-technology. Also, artificiel is not the identity of any author, it is the name of the studio, we are several working in this way, but we keep our names to sign our works. The goal was to create a structure that could accommodate us, a bit like a music label. Initially, we needed this structure, but we were not yet sure what form it would take. And we had no idea that it would still be alive 17 years later. We are working on different things related to technologies in the arts, my personal practice involves working on how to emit sounds or light with mechanisms that are not intended for that. I find this aesthetic research interesting, to go through the exploration and staging of phenomena rather than in the production of media. Our installation projects are very different from our performances because of the limitations of the context. 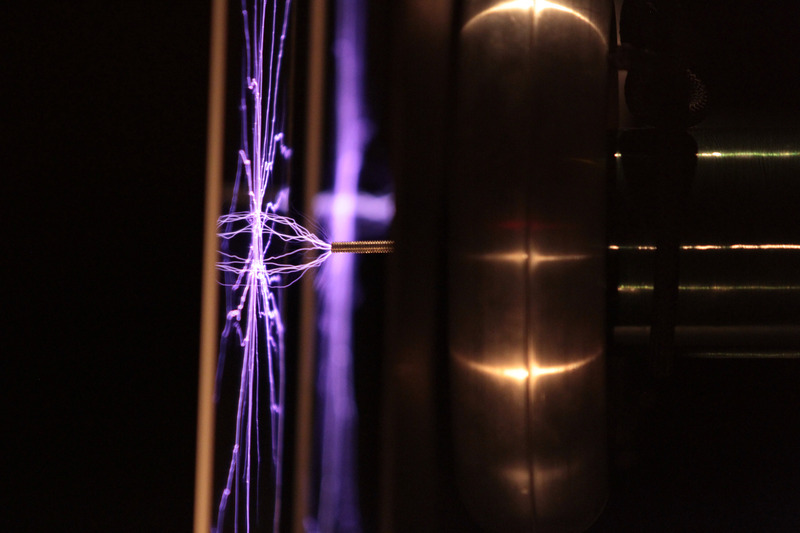 The first version of POWEr was created with a Tesla coil that produced lightning, but the sound was not strong enough and it had to be amplified. With the help of a camera, we could ensure that viewers could see and hear, but that created a distance with the physical phenomenon on stage. So depending on the type of idea we are working on, we determine whether it is appropriate for a performance or gallery context. You say there seemed to be a certain reluctance against media arts, do you still find it’s the case? There was indeed a speech that refused technology. However, I think that today people are increasingly accepting the mixing of new technologies with more traditional forms of art. And the goal for us has never been to prove that we can make art with machines. What is the value of using new media for creative purposes? It is about bringing creativity elsewhere and transforming the tools that the industry offers us. The tools come with preconceptions that impose boundaries on potential. By creating our own instruments and software, we can free ourselves from these constraints. As a creator it is very interesting to be led into areas that have not yet been cataloged. What is the responsibility of an artist working to develop new technologies? I would say he has the same responsibilities as any artist. We work according to a process, at the ethical level for us it is important to always do something incarnate, concrete - unlike an approach that would be based on the effect. In the approaches that surround new media, the term "live" it is often ambiguous, we see presentations that are named live performances, but offer pre-recorded media to get around the problem of the limits of live performance (for humans as well as machines) and find themselves doing a kind of "lip-sync", or maybe karaoke. This is not necessarily bad, and it is certainly “effective", but it must be explicit, not a surface artifice. You define yourself as a "digital luthier” (instrument maker), can you explain what this means? I started using this term in 1999 at the FNC (Festival of New Cinema) at a symposium on new creative tools. The conference that I gave then was based on the principle that when we create with new technologies, there really is a stage of instrument crafting. It is a reflection that goes into the construction of a device whose destiny is to make art, but which is not a piece of art itself. With artificiel we build instruments that others can use. It is a first stage of development. We are trying to claim the stage that is prior to the work. For example, the piano is an accumulation of knowledge through time and the result of the advancement of technologies and materials (which were high tech for the period). It was not invented at once. Same thing for wind instruments and strings. What are you going to present at MUTEK? With Julien Roy we present this year, Three Pieces With Titles, a direct descendant of two of our old projects. Cubing that we presented in 2006 and POWEr in 2009. These are two projects in which there was a camera that filmed live and controlled the sound. Cubing was made with Rubik’s cubes and we used color to synthesize the sound. 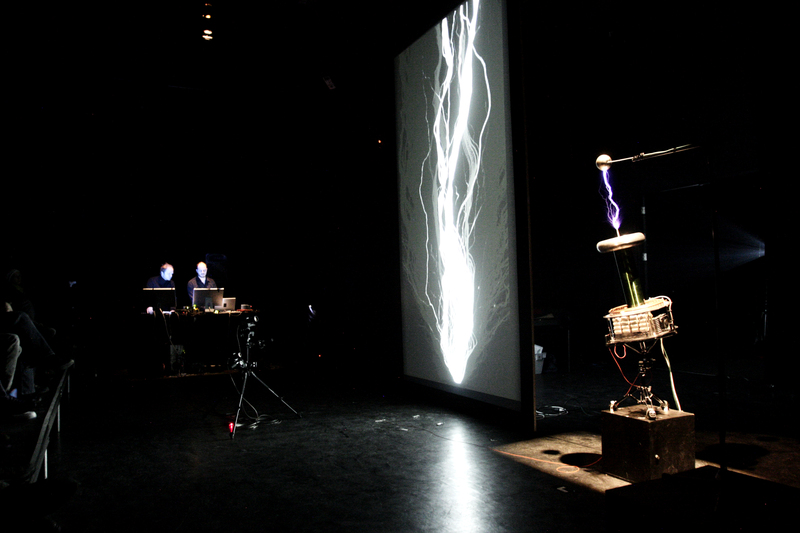 POWEr was created with a Tesla coil, and a device that made live audio sampling that was re-injected into the media device. In both cases, the aesthetics of the final rendering was tainted by the quality limits of the cameras used. This time it will be a device again with a camera and a microphone, but now technologies allow us to process the image at a transparent level. We can film live, process the image and rebroadcast it without losing the level of quality. Our goal is ultimately to no longer feel the technique. The universe of the piece is built before, but the details are unique every time. Let's say it's like jazz, we improvise inside some scales. Your work seems to be reflexive, how important is it for you that art reflects on itself? I think that this is the sole function of art. Three Pieces With Titles is a reflection on our approach. Many people spend a lot of time thinking, and even if I think too (laughs), I do not write philosophy. It is important for me to build on what has been done before. Certain philosophical movements had immediate repercussions on the art of their time. I’m thinking of Umberto Eco or Deleuze, they wrote philosophical speeches directly connected with artistic practices. What I see in academic circles today is stagnation. Deleuze, Simondon continues to be studied. This is not bad, but we are no longer in the action of the present moment. I try to find today's thinkers who reflect on things that - according to my interpretation - have an impact on today's artistic practice. You quote The End of Time by Julian Barbour as a reference, how are these principles found in the work? Julian Barbour is a mathematician who proposes a theory of non-time, where "reality" is a sequence of instantaneous moments, Nows, which are complete and autonomous configurations of the universe. Our perception of time is very formalized by clocks, time is for us a kind of evidence that flows inexorably, but it is in fact a very superficial and very local notion. Barbour has been interested in the perception of time at the cognitive level and defines it as a slide through all possible instantaneous moments. It remains to be understood how time is actually perceived at the neurological level, how one can explain this sensation of time passing. But his proposal is a solution to the deadlock of the notion of time at the quantum / relativity level. What I found interesting about his theory was at the level of composition. I see composition as building a potential that becomes a meta-cube of possibilities. With our crafted instrument we walk into this frame and the journey becomes the experience that we are living. The experience is only potential until it becomes a Now, which is exactly when it becomes memory. This relationship of an experience of the present moment within a succession of configurations in a system that stands, is for me, an interesting context for creation. All of this is not written in the program notes, but it feeds the reflection. Your colleague Jimmy Lakatos presents another project in collaboration with Murcof during the festival. Indeed, Jimmy's project is a project where a chosen part of the sound composition will be synchronized with lasers in a subtle way; It will be an unpredictable and abstract structure, but intimately and sensitively linking sound and light. What are some future projects for artificiel? I am currently working on an installation of electromagnets that will hold an object that vibrates and produces sounds in magnetic suspension. If everything goes well it will be ready in the Fall. 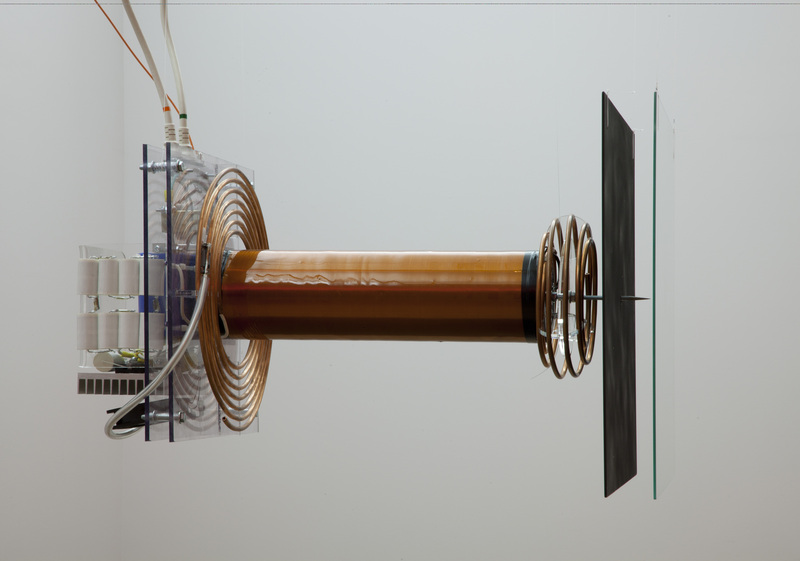 In this project there is no contact between the object and the magnet, it floats and it requires a lot of energy. It will be necessary to fight against the gravity with a powerful custom made electromagnet. The kind of equipment used for particle accelerators. We also do integration projects in cultural contexts. I have an commission for an installation project at the Ottawa Museum of Technology. They reshaped their exhibitions, and part of it was on sound research in Canada in the 1960s. R. Murray Schafer, a professor at Simon Fraser in Vancouver, wrote a book called The Tuning of the World (The Soundscape) and was one of the first to speak about sound ecology, and undertook to document places and moments using field recordings in order to preserve their sound. In the museum there will be an electroacoustic installation based on these notions. It will be an interactive space that will create soundscapes according to the movement and dynamics of the people in the room. The idea is to work around the idea of field recordings, but the goal is not to be documentary; I intend to work on transitions between places recognizable as "landscapes", and impossible places (like to the inside an analog synth) and make it all interesting for the general public while remaining relevant on the artistic level. Finally I have a project called Super Super with the choreographer Line Nault which will be presented at the Agora de la Danse next year. It is a performance for two dancers, organized in three pieces. Each piece features a reactive audiovisual element that interacts with the dancers through a 3D location system. artificiel will present Three Pieces With Titles within the signature A/VISIONS program of the festival, for more information consult the website here. Read Julien Roy and Alexandre Burton's biography.